When I had Joss I quickly developed an early onset anxiety. In the early days I worried I wasn’t going to be a good mama, when she was six months old it got too much to bear. These six statements are intended to encourage and support mamas experiencing similar feelings and issues. In my case this was probably more postnatal anxiety than postnatal depression, but I hope that talking about my experiences might help other mamas, without the labels as I’m no expert! This has become a bit of a mantra when I meet new mums at baby groups and the likes. I remember Joss being about five days old and I couldn’t rest, couldn’t sleep, I was frantic, reading books about breastfeeding, routines, anti-routines, turning night into day and day into night, child development, I felt overwhelmed! Things came to a head when my husband hid a copy of Gina Ford under the bookcase and a copy of Your Baby, the First Year in the shoe cupboard. How could I be the best for her? Was I meeting her needs? What more did she need? What about her development? Her weight? Oh my, her weight, was she putting it on, was she swallowing milk, how could I keep her awake to feed, questions, questions, questions. 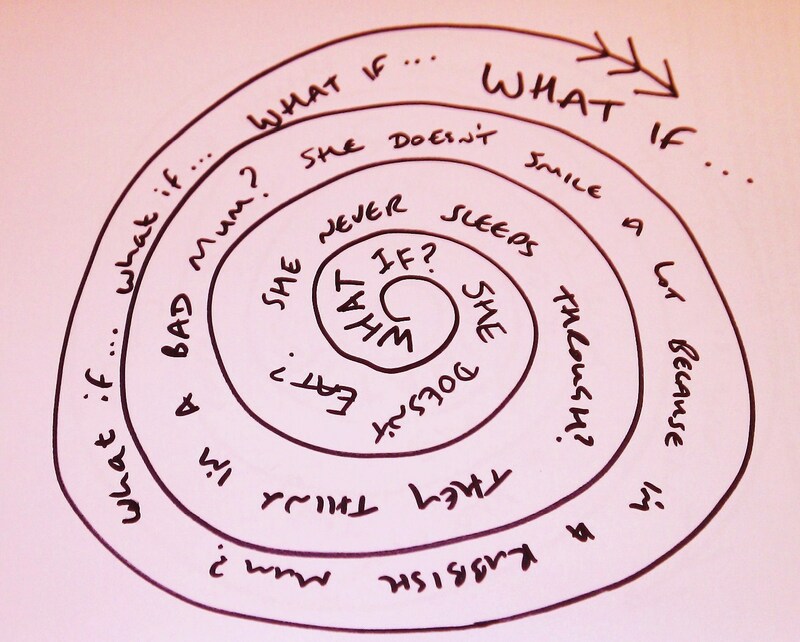 It was that classic anxiety, that old what if? that has followed me through most of my life. It was back, last seen at uni, 2005, back in 2012 with a vengeance. Looking back I knew more than I gave myself credit for, she is my daughter, she just sort of fits with me, I got to know her whims, wants and needs quickly and all seems to be well, so have faith mama, you know more than you think you know. Try to let bad days be just that, a bad day, don’t fret and let it turn into a bad week, a bad month, this too shall pass and you are doing the very best you can. When I was really really anxious, I remember it well, it was about weaning and whether Joss was eating enough and whether I was feeding her a good enough balance, at that time I was really worried that I was worrying too much. Someone said to me, what would happen if you didn’t worry about your little girl? It taught me that worry is on a continuum, too much and we tip over, too little and we don’t do enough, so a little worry is healthy, don’t beat yourself up if you’re an anxious sort, we’re ok, there are a lot of us out there! Someone asked me recently whether Joss is walking, she isn’t. You know at baby groups, there’s always someone who wants to know what all the babies are doing, usually because their child is ahead? That used to get to me, not anymore, I look at that smiling face and think to myself, if I can make you smile every day and you make me smile too then the rest will follow, and it will! We had this on a babygro, I liked it, when I read it and realised it meant I needed to slow down and have some time for me it sort of became a mantra. Don’t burn yourself out, I sometimes (ok often) worry that I shouldn’t be away from Joss, mamas at baby group would gloat about never having been away from their little ones. If you want to stay with your baby that’s cool, if you want and need a break then ask for one, and don’t feel guilty, a little time may just refresh you, this is especially important for me now Joss is teething – on those days when you can do no right you sometimes just need five minutes peace and quiet just to catch your breath and head back into the fray with a smile. This won’t work for everyone, I used to do my sense checking via Google, see something I didn’t like and spiral away into anxiety. I learned through CBT to do it in my own head, so when I was anxious that Joss wasn’t eating well and skipping meals I looked to how energetic she was, windmilling away and rolling, I learned that babies can regulate their own appetites quite well thank you very much, and let her take the lead, it helped to work through my worries logically sometimes. If you’re interested in CBT you could speak to your GP, many areas have self-referral into CBT now too. There are also lots of mental health and post partum networks online, just search #ppd or #pnd on twitter and a lot comes up.